Why Do Some Conservatives Believe Mueller Will Clear Trump? Among the hardest core of the hard-core Trump fan base, it is an axiomatic truth that the Mueller investigation is nothing but a sinister deep state conspiracy, or even that Trump is masterfully directing the entire thing behind the scenes. Perhaps more interesting, though, is the viewpoint of an adjacent bloc on the right. These conservatives, who seem to hold the political high ground within the Republican Establishment, do not frontally attack Robert Mueller or deny the basis of his investigation. Instead, they see him as largely vindicating Trump, while perhaps uncovering some minor misdeeds by ancillary figures. They have maintained at least some contact with reality, while still clinging to a belief in Trump’s innocence. How they navigate the delicate balance between the two is a difficult feat, requiring several mental contortions. I have detected several distinct hallmarks of this particular strand of right-wing thought. First, they interpret each incremental development in the Mueller investigation completely in isolation. The overall pattern of the Mueller probe, fleshed out by a large amount of reporting, displays a series of trails between Russia and the Trump campaign. These include the Trump Tower meeting, Roger Stone’s interactions with WikiLeaks, Paul Manafort’s history of pro-Russian political work, Peter W. Smith’s work on behalf of Michael Flynn, to take the most prominent. The Washington Post report last week that Mueller had told Trump he is a subject, but not currently a “target,” inspired celebratory gunfire. 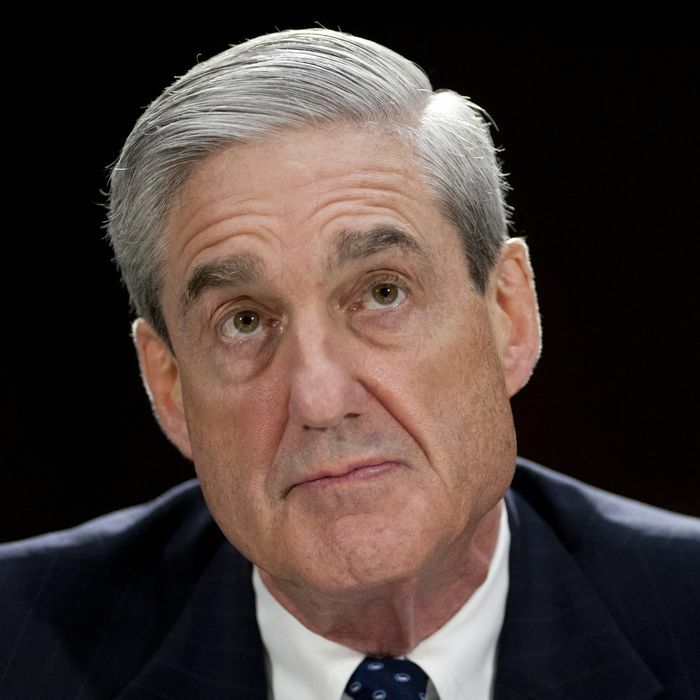 “If, after more than a year, a team of seasoned and aggressive investigators with nearly unlimited access and autonomy couldn’t dig up any substantial evidence linking the president to criminality,” concludes David Harsanyi in the New York Post, “the idea that Trump will be implicated by Mueller, much less face an indictment, is far-fetched.” The basic method is to assume away the possibility that a case is being built. Every incremental development that does not end in Trump being proven guilty is evidence of his innocence. The assumption here is that Trump’s lifelong habit of pathological lying tells us nothing about his underlying guilt. But in reality, Trump’s lying is not random. He doesn’t insist his speech in Pittsburgh took place in Houston, or that the delicious chocolate cake he enjoyed was fruit salad. Trump lies for advantage. His lies to make himself look good or his enemies look bad. If he is lying to Mueller in some non-trivial way, it would almost certainly be out of a desire to conceal evidence. In any case, the legal system is premised on the subjects of investigations having both the ability and the incentive to tell investigators the truth. You can’t just dismiss the need for the central player in an investigation to testify because he’s an uncontrollable liar, like it’s some kind of disability that needs to be treated with sensitivity and understanding. Third, and following logically from both of the above, Trump’s defenders do not see his actions forming any pattern of obstruction of justice. Trump has fired the FBI director after demanding his loyalty and asking him to not indict a central figure in the Russia scandal; has repeatedly tried to discredit the investigation in public, while threatening in private to quash the probe; has urged one witness, Flynn, to “stay strong”; and has dangled a pardon for Manafort. These actions would normally seem to suggest a guilty frame of mind. They would, moreover, imply that at least some parts of the story have been covered up. Manafort is reportedly refusing to cooperate with Mueller because he is counting on getting a pardon from Trump. The fact that Mueller has not yet produced evidence of guilt by Trump might not be terribly meaningful given that the likely most incriminating witness has been lured into maintaining the omerta. Not all of Trump’s allies are so chipper about the outcome of the investigation. One Trump defender has been saying, “this investigation is a classic Gambino-style roll-up” that “will reach everyone in this administration,” and therefore should be shut down. Trump’s critics on the left also see a roll-up underway, but approve of it, for obvious reasons. In between these two very coherent outlooks is a coterie of very hopeful conservatives who seem oddly confident the Mueller probe will somehow end well.